Make your mom smile wide for her birthday! This cake is pink and sweet, a twisty, tall, treat that's guaranteed to bring to bring fun and delight to your mom’s birthday. Let her know that you will always think she is the most wonderful person in the world and no one comes close to compare. 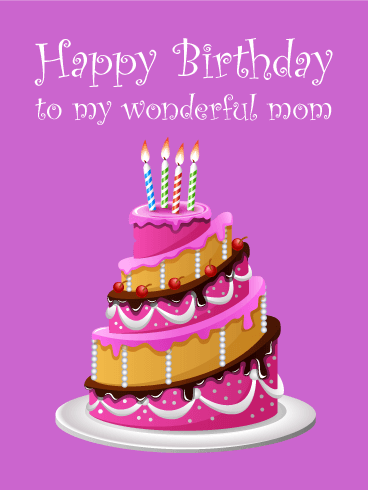 Wish your mom the best "happy birthday" ever! 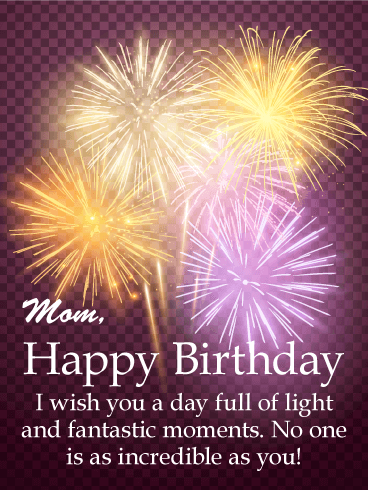 Wish your mother a fantastic day for her birthday! Your mother is the sweetest, kindest person you know. No one else deserves a perfect birthday, one full of wishes for long-lasting health and happiness. Send your mom this small bouquet of flowers, and also send her all your love and birthday wishes. She'll be smiling the entire day after getting your card. Give your mother the love she deserves on her birthday! Your mom has always given you the best advice. Always opens her arms for a hug and is willing to helping you with anything you need. She's a beautiful woman with a sharp mind. No one can compete with your mom. Wish her an amazing birthday and let her know she the most spectacular woman in the world. 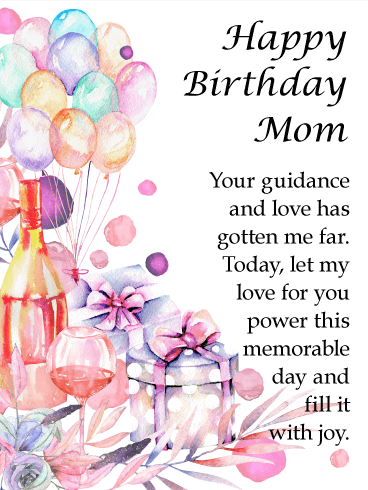 This birthday card for your mom is sent with lots of love! Sweet pink and red hearts float in the background, as your wonderful words remind her that when it comes to hearts, she has the biggest. And that's why you want nothing more than for her to have the most wonderful celebration ever, and for every day after to be just as special. 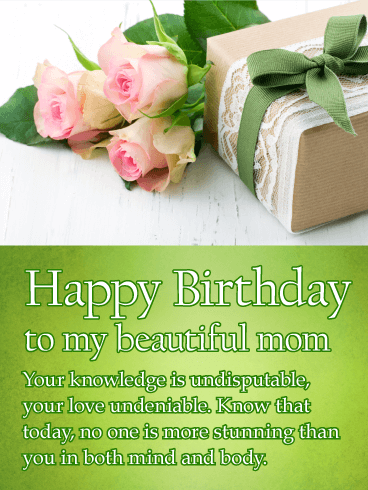 Fill your mother's birthday with love! Birthdays are days full of warmth, when we're surrounded by those who love us. Family and friends, near and far, who can make us laugh. When we're with people we care about, the world is a million times better. Let your mother know that today, you're wrapping her in a warm, loving hug. She'll appreciate your thoughts on her birthday! Your mom is someone who brings joy to so many, especially you. So on her birthday, let her know with this pretty birthday card featuring plenty of festive touches. A purple background at top gives way to a dazzle of lights and a delicious-looking cupcake topped with frosting and sprinkles. Even sweeter is the message: letting her know that you hope all the love she shows to everyone else comes back to her on her special day! 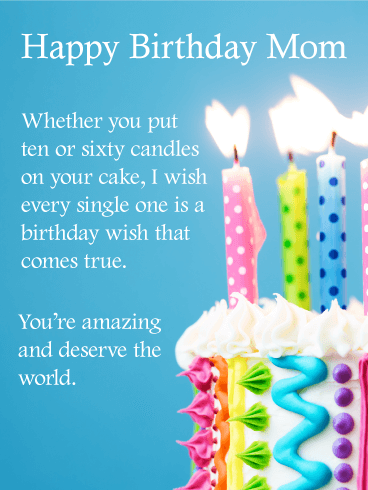 Give your mother this beautiful card for her birthday. Your mom has been a solid presence in your life, a guiding hand and a pillar of strength. Let her know that the love she has for you is matched by your love for her. Wish her a birthday full of joy; a day to go down in history as one of her favorites. 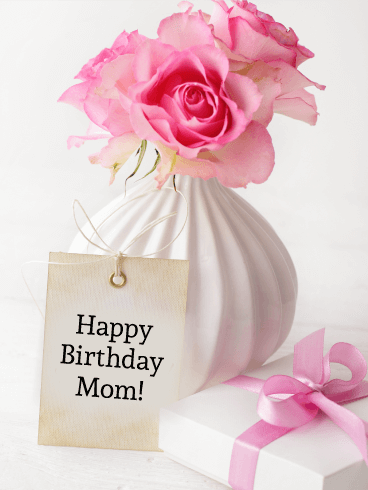 Make your mom's birthday incredible! 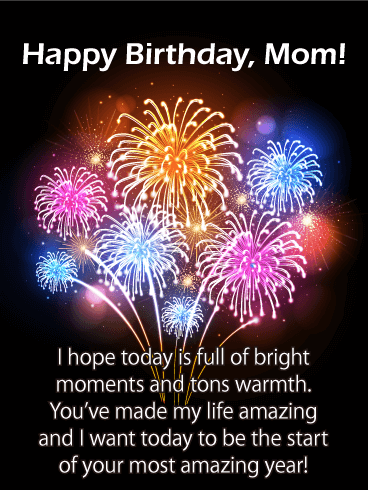 Wish your mother an incredible birthday! Your mom is too amazing a woman to be condensed into a single firework, so send her four bright Catherine wheels. Like her, they’re larger than life and at the center of so many happy memories. 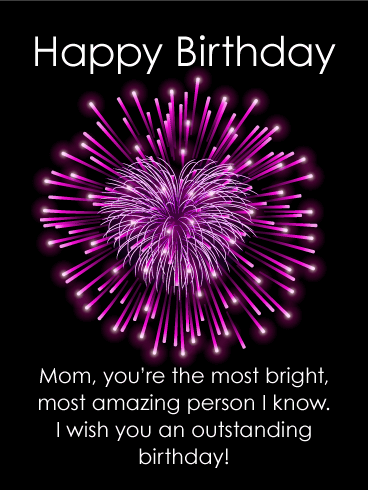 Let your mom know that she's incredible and you hope her birthday is as outstanding as she is. 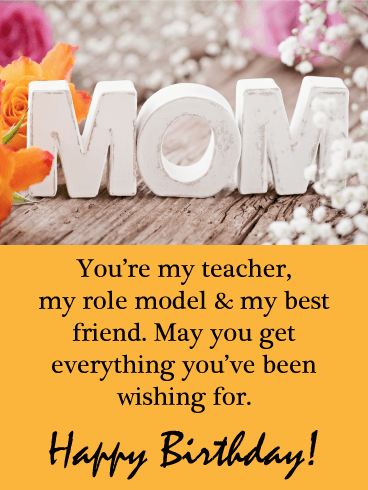 She's your teacher, your role model, your best friend. Who is special enough to take on all these roles? Mom of course, and on her birthday you want to let her know in the most beautiful way possible. 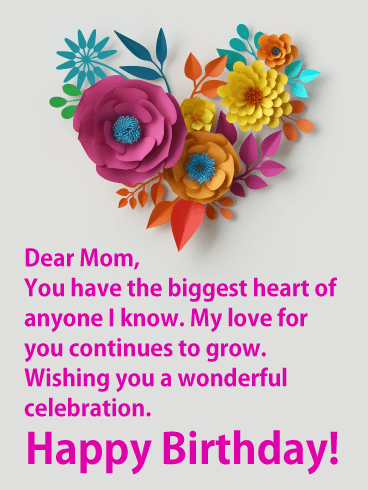 This sweet birthday card showcases a rustic background full of colorful flowers and the word "MOM" charmingly carved above. Below are your words to her, wishing her all the things she's been hoping for this year. After all, she deserves it! 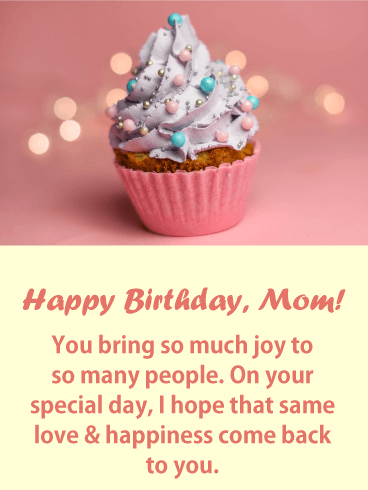 Give your mother a birthday full of wishes! Packed with delicious flavor and topped with a handful of wishing candles, this colorful birthday cake is full of potential. 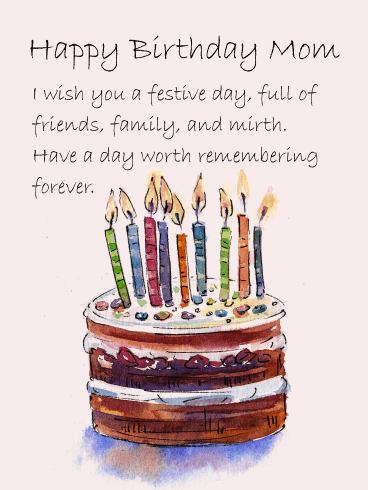 With lots of wishes waiting to be granted and lots of cake waiting to be served, this card is perfect for a festive birthday party! Let your mom know that she deserves to have all her birthday wishes come true!